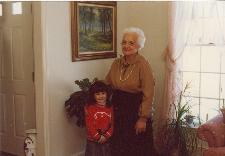 Ever since I was a baby my grandmother had lived with us and watched out for us. She was there when we came home from school, was at the dinner table with us each night, and was there sitting and listening patiently as I rambled and played with my Barbies -- a memory that is so insignificant but so crystal clear. There had always been my dad, my mom, and my grandma as the adults in our close-knit family -- exactly as it should have been. Slowly, imperceptibly, however, the roles began to shift. I was too young to fully realize what was happening, but I think I knew that something was different, that something was changing. Grandma began to refuse to eat, but we would find bologna sandwiches in her dresser drawers, food stockpiled, saved; she would ask for her sisters, her brothers, her mother -- all long passed. When she fell later on, the ambulance showed up in our driveway, taking her to the emergency room. I remember crying. I remember my brother holding me. I remember not really understanding. I remember, though, that she didn't come home, instead moving to an assisted-care facility -- one of the first until she went to a full-care nursing home a few years later. It was the hardest decision my mom had ever made, and I remember the sympathy I felt for her, not imagining that I would be able to do the same, coming to the startling revelation that maybe, someday, I would have to. Because people aren't invincible. And no matter how hard you try to protect them, life and age happens. And it's never, ever easy. I remember the first time I told my mom I wanted to go with her to visit Grandma. She didn't want me to; she wanted me to remember her as she was, didn't want me to see her in the home. But I wanted to see Grandma as much to support my mom and dad as for myself. It wasn't easy, but it wasn't as hard as I expected. She still remembered me, my brothers, though she occasionally called us by different names. Slowly, that began to change, too, though. Slowly, she slipped further and further away as she passed the various stages of Alzheimer's. Sometimes we left laughing after a visit, after hearing her sing "one, two, buckle my shoe" or another nursery rhyme. Other times, we cried and tried to hold on to each other and what we had as best as we could. When Grandma moved into the final full-care facility, we were beyond recognition to her. She called out for her sisters and her mother, a desperate plea that we couldn't answer. I don't remember how old I was exactly -- maybe sixteen or so at the time -- but I was with my Mom in the car when she received a call that my Grandma wasn't doing well. Mom wanted to drop me off at home. I insisted on going, knowing that Dad was at work and Mom would need someone now. It had been awhile since I had gone for a visit -- it was getting harder and harder -- but Mom understood, and Grandma really didn't know the difference. But I did. I knew. Just like I knew that I had to go then, on the day that Mom got that phone call, in the car. She was frail and I barely recognized her, though someone had done her hair and painted her nails. I don't remember much, but I remember the light -- a soft kind of yellow glow from the lamp in the room -- and I remember Mom and I trying to find humor in the obscenities her roommate was yelling. But it wasn't funny. And I think we both knew that. I think we both tried our hardest to mask our tears. If there is one thing I will always be grateful for in this life, it's the fact that I always got to say goodbye to the people and animals I've cared about who have passed. This was my goodbye -- I don't think I realized it then, but I think, somehow, we both knew. I think it might have been that very same night where, late into the evening, the phone rang. I jumped out of bed and ran down the hall, immediately knowing what had happened, and Mom and Dad gathered my brothers and I in the living room and we talked and we shared memories and we grieved. Her funeral was one of the most heartwarming and bittersweet moments I have ever experienced, as the room felt like it glowed with the love of our closest family of aunts and uncles and cousins while we laughed and shared memories and passed around pictures.